Henry Giroux "Youth and the Politics of Disposability in Dark Times": Dr. Henry A. Giroux argues that with the rise of market fundamentalism and the ensuing economic and financial meltdown, youth are facing a crisis unlike that of any other generation. Young people, especially low income and poor minority youth, are no longer seen as a social investment but are increasingly interpreted as a social problem and burden. Chronis Polychroniou: How do you define neoliberalism? Henry Giroux: Neoliberalism, or what can be called the latest stage of predatory capitalism, is part of a broader project of restoring class power and consolidating the rapid concentration of capital. It is a political, economic and political project that constitutes an ideology, mode of governance, policy and form of public pedagogy. As an ideology, it construes profit-making as the essence of democracy, consuming as the only operable form of citizenship, and an irrational belief in the market to solve all problems and serve as a model for structuring all social relations. As a mode of governance, it produces identities, subjects, and ways of life free of government regulations, driven by a survival of the fittest ethic, grounded in the idea of the free, possessive individual, and committed to the right of ruling groups and institutions to accrue wealth removed from matters of ethics and social costs. As a policy and political project, neoliberalism is wedded to the privatization of public services, selling off of state functions, deregulation of finance and labor, elimination of the welfare state and unions, liberalization of trade in goods and capital investment, and the marketization and commodification of society. To read more work by Henry A Giroux and other authors in the Public Intellectual Project, please click here. This is not a good direction for public schooling. This in fact eviscerates the very notion of public education as the bedrock of our democracy. Education becomes no longer a public good, but rather an individual-level decision with our relationship to public schooling dwindling to that of a consumer making "choices" —which is really the best education they can buy—before a marketplace options. This bodes poorly for the guaranteeing of our children's and community's civil and human rights. PHOENIX — A growing number of lawmakers across the country are taking steps to redefine public education, shifting the debate from the classroom to the pocketbook. Instead of simply financing a traditional system of neighborhood schools, legislators and some governors are headed toward funneling public money directly to families, who would be free to choose the kind of schooling they believe is best for their children, be it public, charter, private, religious, online or at home. Currently, 17 states offer 33 programs that allow parents to use taxpayer money to send their children to private schools, according to the American Federation for Children, a nonprofit advocate for school vouchers and tax-credit scholarship programs that give individuals or corporations tax reductions if they donate to state-run scholarship funds. To qualify, students generally must fit into certain categories, based on factors that include income and disability status. Georgia students do not need to meet any specific criteria to receive tax-credit scholarships. And under the income criteria set for Indiana’s voucher program, nearly two-thirds of the state’s families qualify. The Arizona Legislature last May expanded the eligibility criteria for education savings accounts, which are private bank accounts into which the state deposits public money for certain students to use for private school tuition, books, tutoring and other educational services. Open only to special-needs students at first, the program has been expanded to include children in failing schools, those whose parents are in active military duty and those who are being adopted. One in five public school students — roughly 220,000 children — will be eligible in the coming school year. These state efforts come at a particularly challenging time for public schools. Their budgets suffered severely during the recession, and they are now facing pressure to conform to new curriculum standards and to evaluate teacher performance. “We’re not providing adequately now,” said Dennis Van Roekel, president of the National Education Association. “Why would you take away” financing from public schools? In 2002, the Supreme Court ruled that school vouchers did not violate the Constitution’s separation of church and state, even though many families use the public money to send their children to religious schools. Many states, however, still have constitutional clauses prohibiting the financing of religious institutions with public money, which is why some of the programs face legal challenges. Voucher opponents also have filed suits based on state constitutional guarantees of public education. Beyond Indiana, the Supreme Court in Louisiana heard an appeal this month by a group of parents who are currently using vouchers and the Black Alliance for Educational Options, an advocacy group, after a lower court upheld a challenge to the state’s voucher program. They argued that children enrolled in failing public schools had the right to a high-quality education. Critics say schools that accept vouchers or tax credit scholarships often filter out students with special needs, and that families already sending their children to private school use the public programs to subsidize their tuition. It is also not clear that students who attend private schools using vouchers get better educations, as many do not have to take the annual standardized tests that public school students do. Research tracking students in voucher programs has also not shown clear improvements in performance. In Arizona — which, over the past five years, cut more of its K-12 budget than any other state, according to the Center on Budget and Policy Priorities, a policy research group based in Washington — charter schools are ubiquitous and school districts have open borders, so children are free to go to school wherever they want. In January 2012, a Superior Court judge in Maricopa County, which includes Phoenix, upheld the savings accounts, though the plaintiffs appealed the ruling. Oral arguments were heard last month. A decision is pending. Who is Eli Broad and why does he want to destroy public education? The promoters of the corporate reform of public education can be divided into two major groups, conservative and liberal political action committees which believe in an unregulated free enterprise market; and “venture philanthropies” which pour money into various causes that promote the free market and, not coincidently, the profits of the 1%. In education funding, these legislators directly represent the interests of corporate and banking institutions, introducing legislation promoting the privatization of public schools through charters and vouchers. Nowhere is this more evident than in the full-scale assault on public education that has been escalating for the last ten years since the Bush administration instituted the No Child Left Behind law in 2001. Basing itself on rating schools by high stakes testing, combined with declining federal support for education, NCLB has led to wide scale vilification of public school teachers for social conditions over which they have no control. This is being used all over the country as a pretext for closing schools in mostly urban school districts with large numbers of low-income families. As a result, we once again are faced with an increasingly segregated educational system where the children of middle class and slightly better off working class families are transferred into charters which are given advantages in student selection and funding, while the children of low income families are increasingly being left behind in deteriorating public schools. These ever worsening urban public school systems which, already having been inequitably funded for decades compared to wealthy suburban school districts, are being systematically starved of funding. The major conservative political action committee is the American Legislative Executive Council (ALEC). ALEC’s membership is made up of rightwing politicians in legislatures all over the country who propose ALEC created legislation promoting tax benefits to corporations, banks, and the wealthy, and advance the privatization of public institutions such as public education, public transportation, public utilities, state lotteries, and other municipal and state services. In education funding, these legislators directly represent the interests of corporate and banking institutions, introducing legislation promoting the privatization of public schools through charters and vouchers. • Al Sharpton's National Action Network, funded by Plainfield Asset Management, the hedge fund of former NYC Chancellor Harold Levy and corporate sponsors such as Wal-Mart and Pepsi. • The films “Waiting for Superman” and the recent box office dud “Won’t Back Down” , directed by directors who are liberal Democrats, financed by conservative entrepreneur (oil, entertainment, newspapers) Philip Anschutz. Note the targeting of “urban public education”. Eli Broad considers himself a liberal Democrat, as does Michelle Rhee of Students First, who has been on the Board of the Broad Foundation since at least 2008; and Bill Gates of the Gates Foundation. They claim their attempt to restructure American education is the next civil rights movement. They target urban school districts with the highest poverty by having Superintendents from their Broad Superintendents Academy appointed who are prepared to starve public schools in order to make charter schools appealing to parents. The hemorrhaging of students from public schools to charters has led to urban school districts closing public schools all over the country due to “under enrollment”. The other part of the Broad Center for the Management of School Systems is the Broad Superintendents Academy, begun in 2002. It trains eight to twenty-five candidates per year in six intensive four-day sessions spread over 10 months. According to the 2011-12 Annual Report (Page 24), from 2002 through 2011 there have been 144 Broad superintendent graduates. Looking at the toolkit of resources for trainees on their website, you find such things as their 2009 "School Closure Guide: Closing Schools as a Means for Addressing Budgetary Challenges". This 83 page Guide gives a detailed breakdown and timelines of how to manage school closures and community opposition to the closing of community schools. A favored tactic in various cities has been to announce a proposal for closing a large number of schools; hold community meetings to give the appearance of democracy, but actually for the purpose of using the information gained to hone their tactics for carrying out a list of community schools to be closed despite community opposition. Then they take a few schools off the closing list to give the appearance that they are listening to the community. This is a form of the common practice in labor negotiations where management proposes some draconian cuts, and then, when a compromise is reached with the union leaders, the rank-and-file is relieved that the cuts are not as drastic as first proposed and votes to accept the contract even though it is less than they deserve and need. The difference with school closures is that there is no relief for the majority of communities where schools will be closed if just a few schools are taken off the closure list. This school closure method has been used in New York, Chicago, and Detroit, where large numbers of community schools have already been closed. The closings are done in phases to transform large numbers of public schools into a private system run by charter management companies over a period of years. Other guides and toolkits have been created by and “for school districts and charter management organizations with support from The Broad Foundation to help with some of the most pressing and complicated issues facing school systems.” Most were written in 2009 and 2010. These include Administrative Career Path and Performance Evaluation Guide: “This guide will help charter management organizations (CMOs) and school districts – and their human resources staff and line managers in particular – that are looking to develop a systematic approach to evaluating and promoting employees.”, Rubrics for Charter Evaluations, "Bain Chicago charter school involvement summary: 2007-2009", and more. True to the Broad Superintendent Academies undemocratic nature, the Broad Superintendents prefer to operate in secrecy and stealth. Candidate’s graduation from the uncertified Broad Superintendents Academy is not listed on resumes. Usually only an inner circle of politicians and school administrators know of their promotion of the Broad agenda. In Philadelphia, for example, Dr. Arlene Ackerman sat on the board of directors of the Broad Foundation while she was Superintendent of the School District of Philadelphia from 2008-2011. This was not known to the general public and only came out after she came into conflict with local politicians over the disputed selection of a charter operator for Martin Luther King High School. Having poured money into charters and Renaissance Schools while starving public schools, she left the District with a $1 billion deficit over the next five years. On August 25th, 2011, she was given a $1 million buyout of her contract after threatening to reveal “secrets”. Her replacement, Dr. William Hite (Broad Superintendents Academy Class of 2005) took office in September 5th, 2012. During the yearlong interim between Ackerman and Hite’s administration, private philanthropies hired the Boston Consulting Group to develop the plans for the reorganization of the School District. On July 18th, 2012, the School Reform Commission, the state agency that has run the School District for ten years, allocated $139 million for 5,416 new seats in existing charters. On December 12th, 2012, Hite announced the proposed closing of 37 schools due to “under enrollment” at a “savings” of $28 million. After the Chicago teachers strike in September, 2012, to which the AFT gave tepid financial and verbal support (not rallying locals nationally to support the CTU), ended on September 19th, 2012; on September 22nd, Weingarten joined Secretary of Education Duncan, who was on a bus tour through the Midwest to promote Race to the Top. She joined Gayle Manchin, wife of West Virginia U.S. Senator Joe Manchin, on a panel to discuss “how to build public-private partnerships to support educational improvement as the path to a brighter future.” The state run McDowell County, West Virginia school system and the AFT had created the philanthropy "Reconnecting McDowell” in 2011 to foster “collaboration between business, government and nonprofit organizations to establish programs that address the challenges faced by this community.” The AFT has given the fund hundreds of thousands of dollars from the dues of the AFT rank-and-file. On December 13th, 2012, Weingarten held a press conference with Bill Clinton and Obama’s housing secretary Shaun Donovan to announce the AFT would invest $1 billion from the NYC teachers pension fund for Hurricane Sandy relief for the NYC area. NYC Mayor Bloomburg criticized the investment because taxpayers would have to bail out the pension fund if the investment failed. One month later the U.S. Congress allocated $50.5 billion dollars for Hurricane Sandy relief. Now largely dedicated to their venture philanthropies, he and his wife Edythe Broad live in Los Angeles and oversee The Broad Foundation. The foundation is not only dedicated to “reforming” public education, but has used their fortune in the arts world and in medical research. They have given an estimated $3.5 billion (more than 50% of his current net worth) to their philanthropies, including $600 million to set up The Broad Institute for biomedical research at Harvard and MIT. He and wife Edythe created the Broad Art Foundation in 1984, which now holds more than $2.4 billion worth of art that is lent to art institutions around the world. Their influence in the Los Angeles arts community has been as controversial as their role in American education, though far more localized. In 2012, Broad’s book The Art of Being Unreasonable: Lessons in Unconventional Thinking was published. The inside flap of the book has this quote from George Bernard Shaw: “The reasonable man adapts himself to the world. The unreasonable one persists in trying to adapt the world to him self. Therefore, all progress depends upon the unreasonable man.” George Bernard Shaw was speaking of fighting for social justice. As always, Eli Broad is speaking about what makes a good businessman. The Broad fortune is based on the speculative capital made possible during the deregulation that began under the Reagan administration. Taking public controls off of private capital set the stage for the wealthiest one per cent in American society to amass enormous personal wealth and use that wealth to lobby and legislate the radical redistribution upward of wealth and income over the next thirty years. It is this ideal of deregulation that Broad holds up as a metaphor for public education. The only way to do that is to hand over public institutions to the private sector. As is being seen with the unfolding disaster of school closures, applying private sector methods to public institutions ignores economic and social reality. Downsizing a corporation to please Wall Street investors is not the same thing as downsizing a public school district because it is not turning out enough students ready for college. (For further analysis see "The Rise of Venture Philanthropy and the Ongoing Neoliberal Assault on Public Education: The Eli and Edythe Broad Foundation"
Just as the people of the world continue to suffer from the economic tremors of the 2008 financial bailout, just like the collapse of the housing bubble, the tremors created by corporate education reform will cause an economic earthquake that will collapse corporate education reform like the house of cards that it is. If supporters of public education mobilize to support it, left standing, though battered and wounded, will be the U.S. public school system that began after the American Revolution…but what about the children growing up in this war? Copyright © 2013, Defend Public Education. All rights reserved. A financial analysis for 2012 of the British-based publishing giant Pearson is available online at 4-traders.com. It tells a very interesting, if frightening story that needs to be more widely circulated in the United States, especially among parents, teachers, and educational policy makers. Something consistently missing in a report that emphasizes growth and profit is students and whether Pearson's high tech snake oil actually promotes student learning. * Pearson is a money making machine, but is this education? The headline summarizes the multi-page post. "Pearson accelerates global education strategy: Restructuring and investment in digital, services and emerging markets for faster growth, larger market opportunity and greater impact on learning outcomes." It is followed by "Financial highlights." Sales were up 5 percent in 2012 to £6.1 billion or $9.21 billion, with "digital and services businesses contributing 50% of sales." Operating profit in 2012 was £936 million or $1.4 billion. But there are business problems that Pearson is moving rapidly to address. According to the report, "Market conditions generally weak in developed world and for print publishing businesses; generally strong in emerging economies and for digital and services businesses." However, there is "Considerable growth opportunity in education driven by rapidly-growing global middle class, adoption of learning technologies, the connection between education and career prospects and increasing consumer spend, especially in emerging economies." As a result of this repositioning, Pearson's "North American Education revenues" were "up 2% in a year when US School and Higher Education publishing revenues declined by 10% for the industry as a whole," while "International Education revenues up 13% with emerging market revenues up 25%." Pearson plans further restructuring and investment in "fast-growing education markets" that by 2015 should "produce faster growth, improving margins and stronger cash generation." Pearson hopes to "capture the once-in-a-generation opportunity that comes with being the world's leading learning company... Over the past 15 years, through a major programme of organic investment and acquisitions, Pearson has become the leading education company in the world, with unique geographic reach, product breadth and professional depth. More recently, we have achieved particularly rapid growth in digital products and in education services businesses, which together now account for half our sales... We are therefore planning significantly to accelerate our push into digital learning, education services and emerging markets." To achieve its business goals, Pearson promises that its "products and services deliver demonstrable learning outcomes to the student or the institution. We have therefore developed the Pearson efficacy framework: a unique, rigorous and scalable quality assurance system that checks that the necessary conditions are in place for an education programme to deliver intended learning outcomes. We now require that all Pearson acquisitions and all product investments over $3m go through the Pearson efficacy framework and set out a plan to implement its recommendations before approval." Pearson is targeting higher education as well as K-12 schools, but many of these profit-making innovations can be transferred to elementary and secondary levels. According to the report, "Student registrations at eCollege grew 3% to 8.7 million," which includes "new online enterprise learning contracts with California State University and Rutgers University" and continued partnership with Arizona State University. Students register for online courses through eCollege at their own institutions, but Pearson provides the technological house or platform for the operation. In a budget saving move, the California state legislature is considering requiring California State colleges to accept online classes offered by other institutions if their own classes are oversubscribed, a potential bonanza for Pearson and similar companies..
Pearson is also making money with "MyLab" digital learning, which provides students with homework help and preparation for standardized assessment, assessments which are often designed and marketed by -- guess who? -- Pearson. Pearson's "OpenClass," currently offered to institutions without charge, is used by 1,300 U.S. K-12 schools and colleges. Curiously, revenues were flat in Pearson's "Assessment and Information business." The report complained, "State funding pressures and the transition to Common Core assessments continued to make market conditions tough for our state assessment and teacher testing businesses." But there is a rainbow hidden in the clouds. "The Partnership for Assessment of Readiness for College and Careers (PARCC), a consortium of 23 states, awarded Pearson and Educational Testing Service (ETS) the contract to develop test items that will be part of the new English and mathematics assessments to be administered from the 2014-2015 school year." Pearson also won "new state contracts in Colorado and Missouri and a new contract with the College Board to deliver ReadiStep, a middle school assessment that measures and tracks college readiness skills" and five Race To The Top (RTTT) state deals in Kentucky, Florida, Colorado, North Carolina and New York). Pearson has been able to extract these profitable deals through a systematic campaign of buying good will from state and local officials and educational institutions. Pearson's not-for-profit foundation has paid for local and state educational commissioners whose schools do business with the for-profit Pearson corporation to attend international conferences in Rio De Janeiro, London, Singapore, and Helsinki where they meet with Pearson executives. Pearson is a major funder of the American Educational Research Association and the Association for Supervision and Curriculum Development, sponsoring sessions at their annual conferences, advertising and marketing in their exhibition hall, and giving away corporate labeled "swag" to participants. The foundation hosted the welcoming party at the 2013 South by Southwest (SXSW) Conference on emerging education technologies in Austin, Texas, at the same time that Pearson is trying to dominate the digital technology educational market. The foundation paired with the Gates Foundation to develop digital learning material for state Common Core standards at the same time that the company was marketing common core instructional material and assessments. Pearson is developing a new national teacher certification system with Stanford University, and is contracting with states to administer the program. Money, money, money, money, money. Profit, profit, profit, profit. No discussion of educational philosophy, educational achievement, or student needs in the entire report. Is this the company cities and states in the United States should trust with the education of our children? Oh, you would think that with all of these profits made from the public purse, Pearson would be paying a heavy tax bill and pouring money back into the public coffers. But you would be wrong. Pearson was able to take advantage of a Hurricane Sandy tax deferral to significantly lower its 2012 United States tax bill. *Addendum, 3/21/2013: I think my basic disagreement with Pearson Education centers around different definitions of what Pearson means by education and educational achievement. In their financial report, Pearson does discuss student achievement, but appears to equate it with student performance on standardized assessments. There is a national debate going on about the value of high stakes tests such as the ones designed and marketed by Pearson. For me, the question is whether improving test scores through test prep programs constitutes actual student learning and in any way reflects a thought out educational philosophy, an understanding of educational achievement, or meets student needs. In New York City where I live and my grandchildren attend public school, thousands of young children participate in test prep programs, not to learn, but to score higher on Pearson designed and marketed standardized tests. I do not believe executives at Pearson would want this type of education for their own children or grandchildren. My goal is to expand discussion of education in the United States so I would like to suggest two possible resolutions to my disagreement with Pearson. First, I give Pearson permission to reproduce my blogs on own their websites. This would afford them the opportunity to provide an extended response. Second, I like the idea of collaboration. I propose that I write an analysis of the Pearson educational philosophy as presented on a Pearson website and that an agent for Pearson write a response and we post them on Huffington as a joint blog. I also welcome other suggestions from Pearson representatives for expanding dialogue on educational issues in the United States. Very interesting and important piece. Great to see a frank commentary on the subject of race and white privilege and how this privilege can compromise, in some instances, if not many, opportunities for children of color. Certainly, the expansive research literature addressing race, ethnicity, and the schools, attests to this. I wish there were more frankness in the educational system about this. Among other things, these conversations and And the research that accompanies this could be used to better inform policy related to teaching quality in our schools. I also wish that there were more reporters willing to cover these issues of race, class, difference, power, and privilege in their reports. ST. PAUL, Minn. — All the bleak statistics about Minnesota's achievement gap became personal to fifth-grade teacher Jen Engel, when she realized that gap was playing out in her own classroom. "It stares you right in the face. It's real." Engel teaches at Echo Park Elementary School in Burnsville, where about half of the students are racial minorities, many of them struggling academically. The 43-year-old, who is white, has heard about the factors that can contribute to the racial achievement gap, including poverty, unstable living conditions and troubled families. But she says those are no excuses for educators. So Engel is one of several teachers who are learning how to be what educators describe as "culturally responsive" to her students as part of a Twin Cities program offered by St. Mary's University of Minnesota, whose main campuses are in Winona and Minneapolis. "The outside factors are not within my control," Engel said. "When these kids come to school, I see where their strengths are and where the gaps are. It's my job at the end of the day to fill those gaps." Minnesota has some of the worst academic achievement gaps in the nation between white kids and students of color. For example, Minnesota has the nation's worst on-time graduation rates among Latinos and American Indians and is among the worst for black and Asian students. The St. Mary's program is part of an effort among some teachers to make their classes more culturally relevant to their students. It requires the teachers -- most of whom are white women -- to find new ways to connect to struggling kids. St. Mary's instructor Marceline DuBose encourages her students to shake up their traditional teaching styles. She said music and movement can help capture students who learn differently. The education system is already working best for white, middle-class kids, particularly female students, so it's no surprise that many teachers share those traits, DuBose said. The state Department of Education estimates that less than 4 percent of Minnesota teachers are people of color. Yet more than a quarter of Minnesota's students are nonwhite. Sometimes, that disconnect can result in a not-so-subtle bias. DuBose, a former social studies teacher, said she had former colleagues who gave up on poor or nonwhite students. She recalls hearing them bemoan that classrooms aren't what they used to be. "They were white teachers and had been teaching for a number of years, and they would attach directly 'the way it used to be' with the idea that they had to alter their rigor and expectations, because they just weren't going to get from the students what they used to get," DuBose said. Those lowered expectations can play out even for students of color whose families are well-off. Luz Maria Frias is a Latina mother of two, married to an African-American man. Both are attorneys. Frias remembers confronting her daughter's elementary school teacher after learning he had not selected her for a gifted program. She came to school armed with standardized test scores showing her daughter scored in the nation's top percentiles, she said. "He admitted he was very familiar with her academic achievements, and that she was a gifted child. And when I asked why he had excluded her from the gifted program, he said he had forgotten." Note: MDE collected the teacher data through a self-reported system. Because the reporting is not mandated, there may be some margin for error. Frias then asked him how many kids in the gifted program were girls or kids of color. The teacher acknowledged that there were none. "It was a tough conversation," Frias said. "His first reaction was, 'Are you calling me a sexist?' And I said to him, 'You'd be really lucky if I stopped there.'" Frias, now a vice president with the Minneapolis Foundation, was able to persuade the teacher to include her daughter in the program. But she says not every parent is savvy enough to push for these kinds of opportunities for their kids. 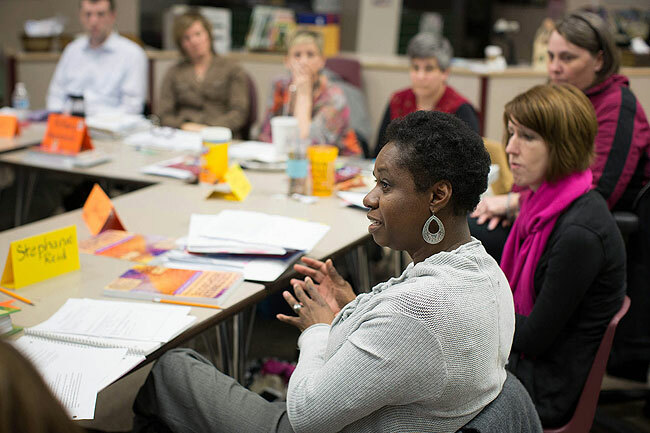 Supporters of culturally relevant teaching say it's not just about believing in your students. It's about developing deeper relationships with them and not shying away from the prickly subject of race. Tracine Asberry, an African-American school board member and a former teacher in Minneapolis, says it's natural to teach who you are. But if you come from a privileged background and don't believe in the struggles faced by many people of color, your opinions can alienate a lot of kids. "As teachers, teaching students who have different realities, we have to be aware of those things. We can't just be aware of them. We have to be comfortable so that we can have the conversation, and then encourage our students to feel comfortable to have those conversations in our classroom." Asberry believes one way to close the achievement gap is to close the teacher gap. For some students of color, she says, the key might be as simple as making sure the person leading the classroom looks like them. To learn more about St. Mary's program go here. Afghan Girl -- Happy International Women's Day!